Contrary to popular myth, we do not yet live in the "Information Age." At best, we live the "Data Age," obsessed with the production, collection, storage, dissemination, and monetization of digital data. But data, in and of itself, isn't valuable. Data only becomes valuable when we make sense of it. We rely on "information professionals" to help us understand data, but most fail in their efforts. Why? Not because they lack intelligence or tools, but mostly because they lack the necessary skills. Most information professionals have been trained primarily in the use of data analysis tools (Tableau, PowerBI, Qlik, SAS, Excel, R, etc. ), but even the best tools are only useful in the hands of skilled individuals. Anyone can pick up a hammer and pound a nail, but only skilled carpenters can use a hammer to build a reliable structure. Making sense of data is skilled work, and developing those skills requires study and practice. 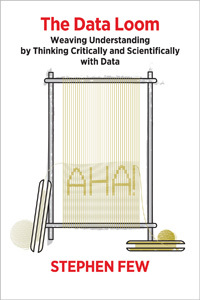 Weaving data into understanding involves several distinct but complementary thinking skills. Foremost among them are critical thinking and scientific thinking. Until information professionals develop these capabilities, we will remain in the dark ages of data. This book is for information professionals, especially those who have been thrust into this important work without having a chance to develop these foundational skills. If you're an information professional and have never been trained to think critically and scientifically with data, this book will get you started. Once on this path, you'll be able to help usher in an Information Age worthy of the name. Permission requests, desk/review copies, or questions about this book? Want a single copy? We recommend you buy it from Amazon or another fine bookseller. Want multiple copies? Please contact our distributor, IPG.